Chrysler Grand Voyager | What Car? 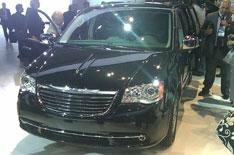 Chrysler plans to replace its entire model range during the course of this year. A heavily revised Voyager MPV will come to the UK in May and an all-new 300C executive saloon will enter the showrooms in 2012. It is a story of how people react when their backs are against the ropes, said CEO Olivier Francois. It is time for Chrysler to come back. The updated Voyager, while built on the same platform as the current car, has been comprehensively re-engineered with a new petrol engine and transmission, new suspension, more safety and luxury features and a redesigned front end that adopts the new grille that will also adorn the 300C. Chrysler proudly talks about the cars 42 standard safety features, including the Parksense system of lights and beeps to warn of any stationary object in the cars path when reversing, and the Crosspath sensors that alert drivers to anything approaching when backing out of parking spaces. Everything occupants touch has been re-engineered, says Chrysler, while revised suspension is said to deliver more stable handling and a smoother, quieter ride. The Stow n Go folding seven-seat interior continues, but a new, more luxurious four-seat layout for the first two rows is being introduced. There will also be rear-seat entertainment packages to help keep children amused. The turbodiesel engine will continue to be the mainstay in Europe. A new 3.6-litre V6 engine, delivering 283bhp and 260lb ft of torque, replaces three previous V6s and comes with a six-speed automatic gearbox for improved fuel economy.